Green Walnuts Gourmet Confiture is 100% BIO Functional Food. 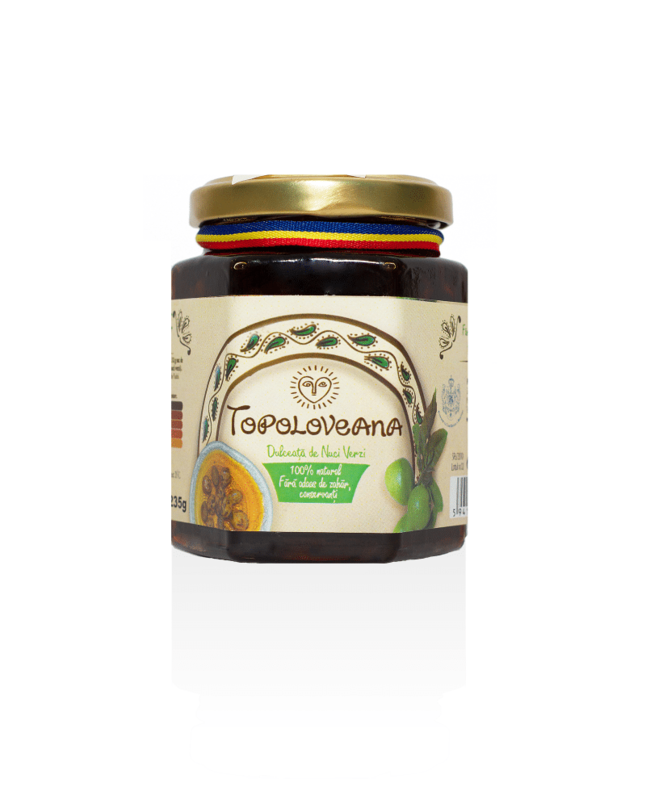 Topoloveni Green Walnuts Gourmet Confiture–230 g.
Description: This product is produced using whole green walnuts which are manually peeled. Content: 68% green walnuts and 32% natural apple juice. Nutritional qualities: This jam has medium energetic value (353 kcal/100 g) and content of food fibers of 4,17%. Benefits: Because of iodine content, the products made of green walnuts skin help maintain stomach and liver health, combat the stomach diseases and acute intestinal infections, and also help purifying blood. The green walnuts skin is rich in calcium (94mg calcium/100g green walnuts) and it is good for the heart and bone system (it prevents osteoporosis). The walnuts, green or dried, strengthen the immune system. The content of vitamin A,E,F and C, the vitamin B complex and minerals (phosphorus, calcium, iron, selenium, zinc, potassium) makes of these fruits the best food for the human brain.